Welcome to the Elmwood Park Public Library! Materials can also be borrowed from throughout the state and the country through our Interlibrary Loan program. Only BCCLS ILLs will presently be processed. JerseyCat requests (NJ and USA) will be on hiatus until construction is completed and the library is reopened. *Starting Tuesday, February 19th, 2019 you can get your library card replaced, renewed, or signed up for a new one at the Fair Lawn Public Library. This service is temporarily unable from Monday, February 11th, 2019 to Monday, February 18th, 2019. Sorry for the delay and thank you for your understanding. 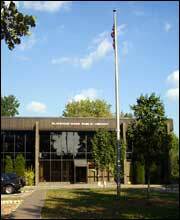 The Elmwood Park Public Library is scheduled to close for construction. Our last day will be February 10, 2019. After February 10, you will need to return library materials at other BCCLS libraries. While the Elmwood Park Library is closed, you will be able to use your Elmwood Park Library Card at any other BCCLS library. If you need to replace your library card, you will need to visit the Fair Lawn Public Library.